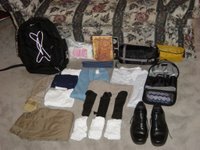 Curious What to Bring to Europe for Four Months? The Cities, the Countries, the FUN! "This is your four month trip to Europe?! Are you out of your minds?" Yes. Yes we are. Our excitement is bubbling over. How could it not: we fly out in four days! For a quick, easy and accurate answer to "Where exactly are you going? ", this map will serve our questioneers much better than a verbal recitation of city names. We respectfully acknowledge that this map was taken without permission from www.adrianchapman.com. Click on the map! It enlarges the map.